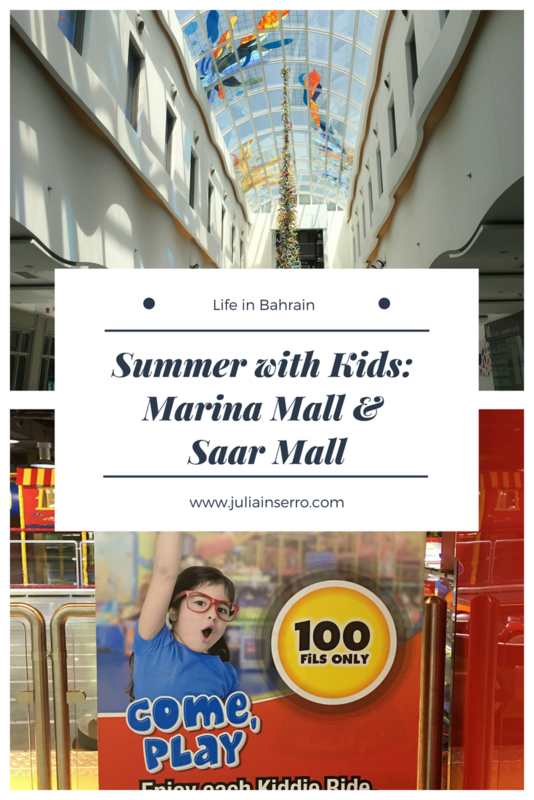 The mall exploration continues: Marina Mall and Saar Mall. Marina Mall is located between Dana Mall and Bab Al-Bahrain (the souq). I should add that I've gotten lost both times I've attempted to go there. I gave up the first time, but persevered the second and finally made it. Gotta love road blocks and no-left-turns. At the last minute I made a daring move to drive through an alley for vegetable wholesalers to try to find the mall entrance. I made it, but I think I need to find a better route for next time. 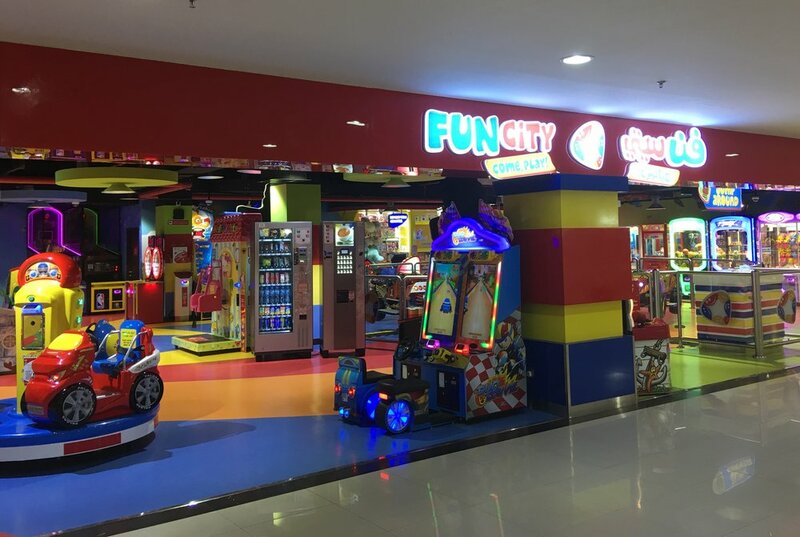 The mall doesn't have anything else specifically for kids, other than the Fun City play area. But having said that, it's a pretty nice play area. It's not as extravagant as Dana Mall, no rollercoaster or water rides, but it's very clean, has a few little ride-on rides (train, merry-go-round), bumper cars, video games, and a very nice play area. The play area costs 3BD per kid, but has unlimited time. They do require socks for everyone who enters (hence my new 500 fils fancy play-area socks). Unlike others I've seen, they have some free ride-on rides such as a merry-go-round and a bouncy boat that plays an endless stream of music, ranging from "It's a Small World" to "Happy and You Know It" and various Christmas songs. They have two levels and slides and lots of things to climb in, around, over and under. The one negative I found was that it's designed for 3-footers, not for their parents. So if you're trailing your little ones around, then it's endless bending and crawling for Mommy and Daddy. But even with that, it was a lot of fun for all three kiddos. There's also a food court right there and bathrooms around the corner. When you go, ask for their 9.900BD special. We were not told about it until after we'd put money on our card. But they are offering a card for 9.900BD that will allow your kid access for 100 days. You could easily make it worth it (especially if you find a better driving route). Note, it is per kid, not per family. 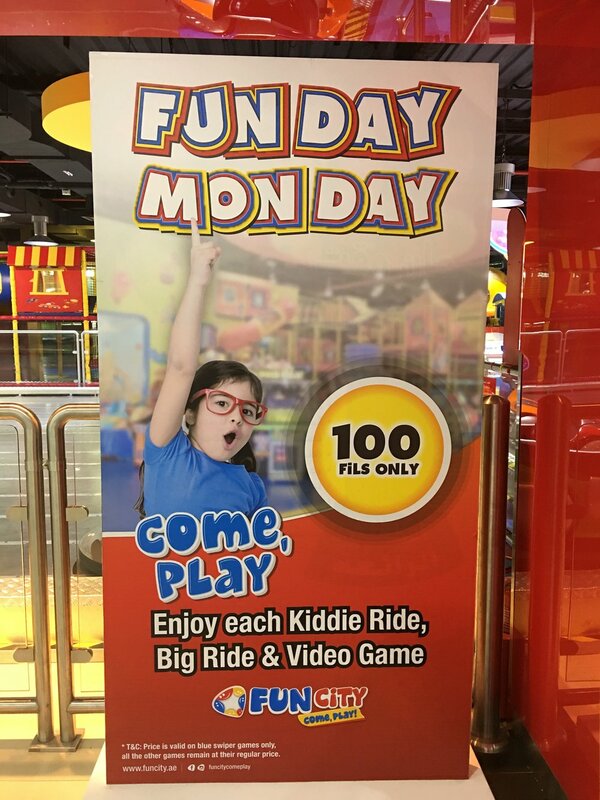 Note they also have a "Fun Day Monday" special for just 100 fils for the rides and games. The one major negative was the parking area. It's ridiculously maze-like and there's barely enough room for two cars to pass each other. Someone apparently had extra concrete and decided to make endless curbs. Next time we go, I'm going to see if I can park outside of the mall's lot and walk in from elsewhere (maybe the vegetable guys will remember me) -- even in the 108 degree temps. Saar Mall is located in Saar (clever, huh?). It's also a smaller mall, but it has a Costa Coffee, a Starbucks, a grocery store and a Lumee (great food) as well as Aptex, a print shop that can print color copies, photographs, etc. (located in the basement). 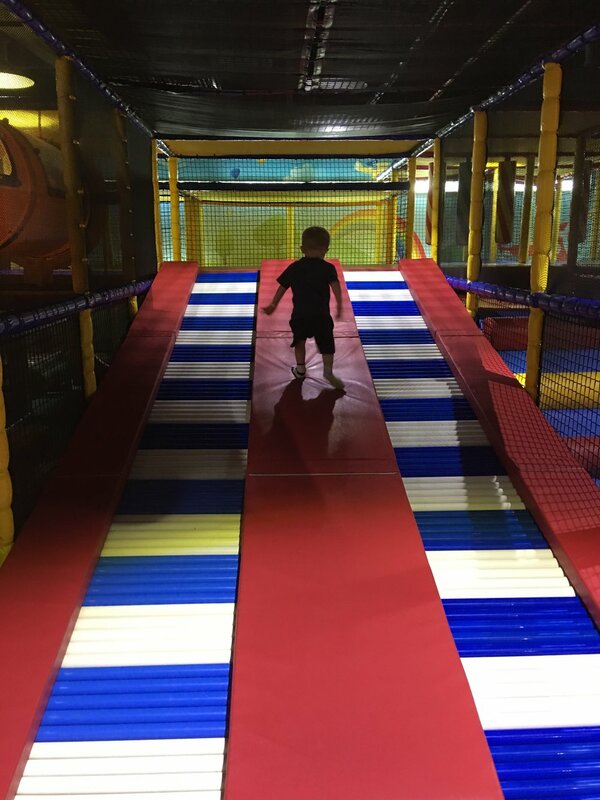 Off the food court is the small play area called Kids Palace Toys and they have a few little rides, some carnival games, video games, and a Sand Zone area (1.500BD per hour, per kid). 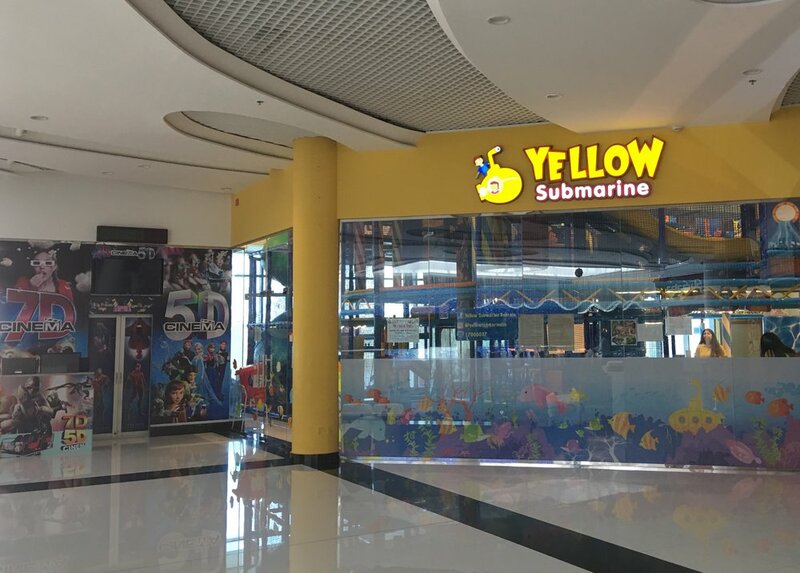 The Yellow Submarine is the enclosed play area here. It's very popular with lots of expats, however I have yet to try it out. Namely because it's quite expensive. They charge 4BD for one hour for one kid. For me that's 12BD (~$31) for one hour of play. Yikes! I will say that it looks nice and clean and there were lots of things for all aged kids to do, but unless I can find a coupon or go on a buy-one-get-two day, I'm not sure we'll be spending much time here. And when I went to get information the staff was not overly friendly or helpful; maybe my gasping at the price didn't help matters, but still. Also in the mall is a Ready, Get Set, Cook! Kids Cooking Studio. They had prices written on a white board, saying 1 recipe was 8BD and 2 recipes were 12BD. They weren't open when I went, but they did have a sign up saying that parents and nannies were not allowed to stay with the kids during the session, so obviously this is something for older kids. They had no contact information posted, but they noted they were open at 10:00 AM. So, smaller malls, but also more options. And when you're looking at spending several months indoors, options makes it all more palatable.